This product requires the base game Quake Champions. Quake's signature rocket jumping, skill-based competition, and incredible speed is back, providing veterans with a welcome return and new players a fresh way to showcase their multiplayer skills. Players will frag enemies using an arsenal of flesh-chewing weaponry; including fan-favorites like the thunderous Rocket Launcher, electrifying Lightning Gun, and snipe-tastic Railgun along with the Shotgun, Machine Gun, and the ever personable melee-masher. Quake® Champions © 2017 id Software LLC, a ZeniMax Media company. QUAKE, id, id Software, id Tech, and related logos are registered trademarks or trademarks of id Software LLC in the U.S. and/or in other countries. Bethesda, Bethesda Softworks, ZeniMax and related logos are registered trademarks or trademarks of ZeniMax Media Inc. in the U.S. and/or other countries. All Rights Reserved. 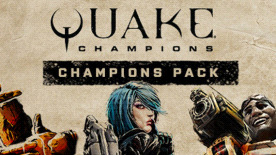 A Bethesda.net account and the Bethesda.net client is required to launch Quake Champions and redeem this DLC. Please view this article for more details on how to redeem your key.